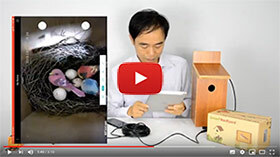 The birdhouse camera’s picture quality depends on the light condition in the scene. The camera works similar as human eyes. If it is too dark, we barely see nothing. The camera has built-in infrared LEDs, which will turn on in low light condition automatically. Once the infrared is ON, the image will switch to black and white. In order see more color image, you may need to improve the light inside the birdhouse. There are two ways and you may apply to both to gain the best colour image from your camera. Cover the whole with 2-3mm thick sanded Perspex. Fix the Perspex with some screws properly. Adjust the camera’s parameters including slower shutter, Wide dynamic range, Gain.